1. I thank you for your kind words of welcome.I am delighted to begin my State Visit to China here in Guangzhou. This historic city has always been an important port of call for Indian business. It is here that we find the ancient foundations of the thriving trade and economic ties that exist between India and China today.Han Shu(Book of Han Dynasty) of 2nd century BCE talks about a direct sea route from Guangdong to Kanchipuram in South India. As early as the 4thcentury BCE, Chinese silk is mentioned in Kautilya’streatise, theArthashastra.It is noteworthy that the age-oldcommercial contacts between our peoples - through land and sea routes - have so successfully evolved, flourished and expanded – and spanned the centuries without interruption.In 2014, an agreement for a sister-province relationship was signed between Gujarat State in India and the Guangdong Province of China. A pilotSmart Citycooperation project has been announced between Shenzhen and the Gujarat International Finance Tec- City in Gujarat in 2015. As I stand before you today, I would, at the very outset, like to say that this is an exciting time for India and China to reinforce the old linkages and join hands for new. 2. India is a young nation. Our primary goal is to build a modern economy that puts a premium on sustainable development. We are steadily moving towards this objective and a profound socio-economic transformation is taking place in our country. China's economic achievements are a source of inspiration for us. We believe that stepping up our two way trade and investment flows will be of mutual benefit to both our nations.Our bilateral trade has grown steadily since the turn of this century. From USD 2.91 billion in the year 2000, it reached the level of USD 71 billion last year. Although the trade balance continues to be in favour of China, we look forward to expanding our commerce to make it more equitable. India would like to see a greater market for our products in China - particularly in sectors where we have natural complementarities – as in the areas of drugs and pharmaceuticals, IT and IT – related services and agro-products.It is a matter of satisfaction that there is emerging focus on two way investment flows.We welcome Chinese investments and entrepreneurs to participate in ‘Make in India’ and other flagship initiatives of our Government. We will facilitate your efforts to make your investments in India profitable. We must take advantage of theopportunities that abound in the growth of both our economies. 3.India has recorded a steady growth at the rate of 7.6 per cent each year - for over a decade now. We believe that India cannot grow in isolation. In an increasingly interconnected world, India would like to benefit from technology advances and best practices of different countries. The comprehensive reforms introduced in key areas of our economy have enhanced the ease of doing business in India. Our Foreign Investment regime has been liberalized through simplified procedures and removal of restrictions on foreign investments. These reforms have renewed the interest of global investors in India. In 2014, there was a 32% growth in investments and in 2015, India emerged as one of the biggest global investment destinations. 4. 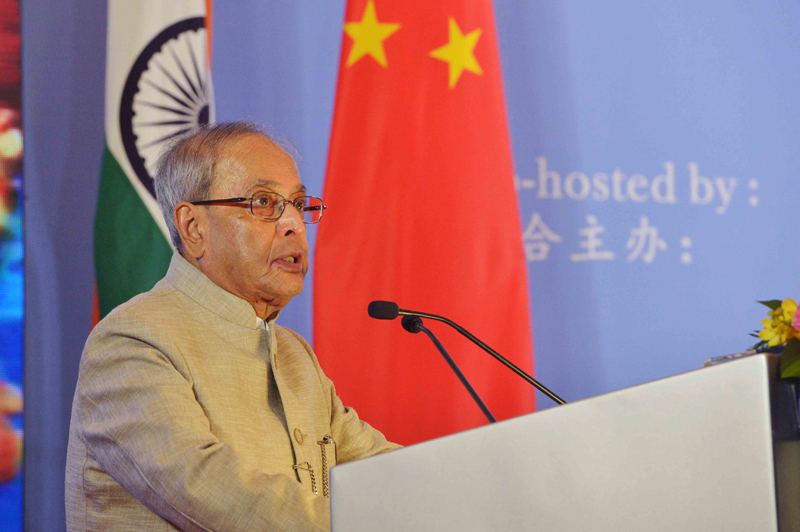 China's Overseas Direct Investment has crossed the USD 100 billion mark - we would like more of it to reach India. As you are aware, India, today, presents a promising demographic scenario. The average age of its population will reach 29 years by 2020. To convert this young population into an asset, we have introduced the ‘Skill India’initiativetoskill 400 million young men and women by the year 2022. At the same time, to ensure growthsustainability, it is important to ignite the spirit of innovation and entrepreneurship in all sectors of our economy. The "Start up India” initiative will aid job creation through innovation and entrepreneurship.Simultaneously, a high priority has been to develop world class infrastructure in a time bound and cost-efficient manner. My Government is establishing industrial corridors, National Investment and Manufacturing Zones and dedicated freight corridors tostimulateinvestment in this sector. Its "100 Smart Cities” initiative will transform a hundred of our cities and towns into engines of growth. The "Digital India”programme aims to transform India into a digitally empowered society and knowledge economy. India welcomes your participation in these programmes. Chinese companies, with inherent strengths in infrastructure and manufacturing, can look towards India as an important destination in their 'Going Global' strategy. On their part, Indian companies can partner with Chinese enterprises in thenewdomain of "Internet of Things” which underlies the'Made in China 2025' strategy. 5. I am happy to note that a good start has been made by Chinese businesses who are investing in infrastructure projects and industrial parks in India. Bilateral cooperation in India's railway sector is also progressing well. A good number of premier Indian IT firms and other manufacturers are present in China. Our people are also considering the prospects of jointly exploring opportunities in other countries. 6. To sum up, Ladies and Gentlemen, India believes that there is great potential for economic and commercial cooperation among our two nations, which face similar opportunities and challenges. The stability of our relationship in recent years provides an enabling basis for utilizing these opportunities and coming together. To realize the full potential of our economic partnership, it is important to bridge the information gap between our business communities. We are committed to providing a conducive environment for more investments from China. We stand ready to facilitate many more collaborations between the industry and businesses of our two countries across different sectors. India invites investors from China to be partners in India's growth story. 7. I am aware of the significant numbers of Indian business visitors to Guangdong Province and those have chosen to live and work in here. I take this opportunity thank His Excellency, Mr. Zhu Xiaodan, Governor of the Guangdong Province and its residents for making the people of India feel so welcome and comfortable among you. 8. With these words, I would like to once again thank the India – China Business Forum for its contribution in strengthening the economic relations between India and China. I wish this Forum great success in its deliberations today and look forward to the positive outcome of its work and initiatives.